National Star has been shortlisted for three national awards. 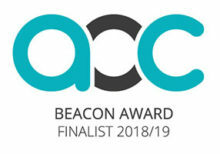 We are a finalist in two categories of the Association of Colleges (AoC) Beacon Awards: British Council International Award and the RCU Support for Learners Award. We are also a finalist in the Specialist College of the Year category in the TES FE Awards. The AoC Beacon Awards showcase best practice and innovation in colleges. It has joined in partnership with TES, to promote and celebrate the great work and success of colleges and the FE sector. The winners will be announced at a gala ceremony in London on 22 March. A team of AoC assessors visited National Star as part of the shortlist process. They commended us on our work over the past year and our significant impact nationally and internationally on learners, staff and in the wider community. Programmes included support for learners, specialist teaching and learning and a range of international courses. Assessors praised National Star for its willingness to share its expertise both nationally and internationally and support other organisations. We were also praised for our staff commitment and our passion for enabling young people with complex disabilities and learning difficulties to achieve their goals. ‘To make the finals of three categories in two of the most prestigious education awards in this country is a tribute to our multi-disciplinary team and their incredible work,’ said David Ellis, Chief Executive of National Star. Last year we supported 647 people with disabilities. We shared our expertise with more than 2,800 professionals and people in the Special Educational Needs sector. We have education bases in Ullenwood, near Cheltenham, Hereford and Wales and offer a range of courses and programmes for day students and residential students.